Home How Do Las Vegas Sportsbooks Set the Sports Betting Lines, Point Spreads and Odds for Each Game? How Do Las Vegas Sportsbooks Set the Sports Betting Lines, Point Spreads and Odds for Each Game? Here’s a weekend recap. Over the weekend, I wagered $67,750 of my own money on my picks, and ended up cashing out $58,329.48. I was up on Saturday and down on Sunday in a day that could have very well been a big day. Yesterday, one Round Robin hit 3 out of 4, losing the final game by a total of only half a run. As you know, Mayweather dominated Mcgregor for an easy winner. 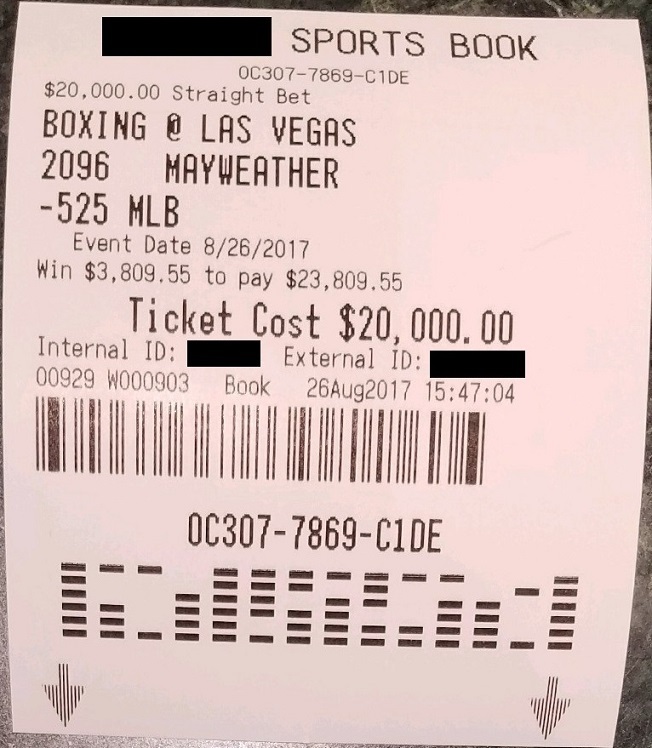 I considered this fight as almost an opportunity to print money at will, and it happened just as predicted! As I’ve always said to you, I want you to judge me based not just on my words, but on my action. The typical touts in the business usually talk until the cows come home on how much they can win. I am the only one I’m aware of who continually go out there and let my actions do all the talking for me. I risk hundreds of thousands to millions of dollars each month on my picks because I know that there is no amount of words that could speak louder than my action. 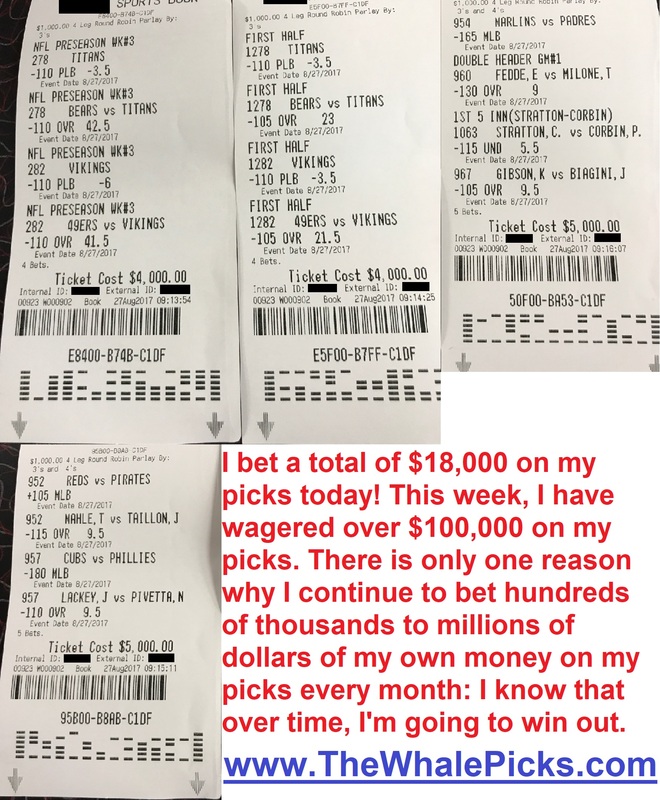 Day after day after day, I continue to go out there and risk tens of thousands of dollars of my own money on my picks because it’s important for you to know that the only way for me to win is when I can help you win. Period! 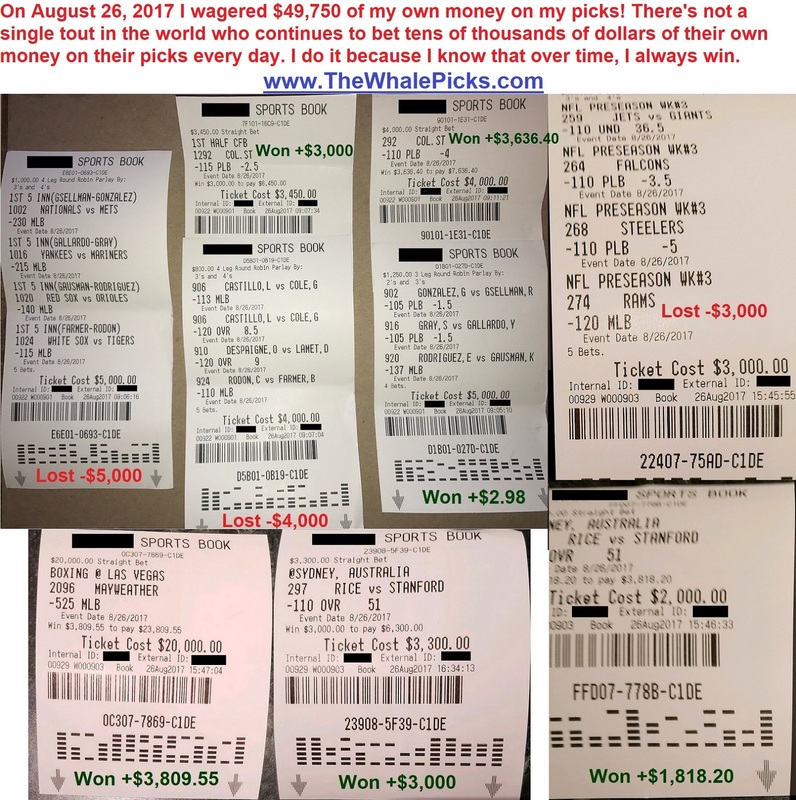 Over the weekend, I wagered a total of nearly $70,000 on my picks. Do I really have to go out there and risk $70,000 of my own money in one single weekend for you to know that I believe in my own picks? No. In fact, I could have just gone out there and risk just $1,000 and that would still be enough for you to know that I have confidence in my selections. The reason why I bet far higher amounts on my picks is because I know that over time, I’m going to be way up. Betting more money is an easy way for me to generate greater fortunes. This is the same strategy that I’ve used for 30 years to go from $1,000 to tens of millions of dollars! -Move the line to a more appropriate number where action is likely to balance out on both sides. Watch my detailed response as to how the sportsbooks determine their lines, odds, and point spreads in the below at the top of this page.